Mercy, mercy, what a total day of frustration! iPhoto still was not working this morning, so I rebuilt it as the instructions said to do, and everything looks fine. However, it continued to spin along, going through all my photos organizing faces… which is rather Big Brother-ish, but I let it do its thing, and it merrily spun along until after lunch. In the meantime, I tried to scan something and email it. Well, since I’ve updated to Mac’s Mountain Lion, my printer driver, I guess, is incompatible. So, new driver? Easy. An hour and a half later, I walked over to Megan’s and used hers. I have sent my plea to Daniel, who hopefully can get me straightened out. I was ready to chuck the stupid machine over the bank… and said very very bad words. By the way… anyone have recommendations for a printer/scanner/copier that is wireless???? In the meantime, Vernon helped me place an order for new wheels and tires for my little mini truck. They never have been much good, restricting my travel radius, but with new tires and spring on its way… me and my mini truck plan on traveling a bit! FINALLY after lunch I made it out to the studio… much nicer day today… NO WIND! I worked literally for hours trying to get one piece of OSB up. You have to clear one board, slip it over a board and pound it into place just to figure out you need to take off a 1/4″. 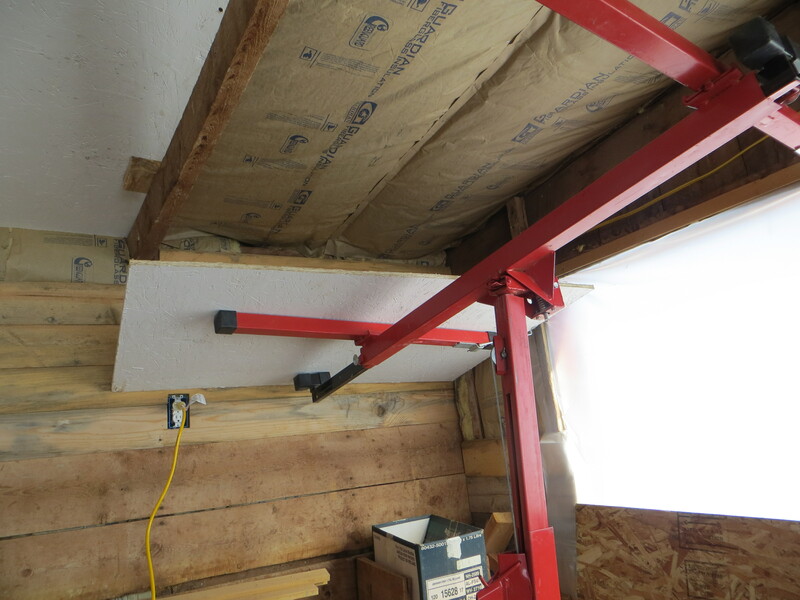 That takes about 50 trips up and down the ladder, move/crank/hammer/pry/hammer… repeat on three different sides. I was SSSSSOOOOOOOOO frustrated. If I had just a carpentry fairy… or an intern… or someone that would just help lift/hold/push/pry and sing/cuss/laugh with me, I would get SO much accomplished. I finally sawed the sheet in half, much easier for me to handle, and managed to get one end up. The second piece now sits on the lift, looking like it’s ready to hang, but no, I have to bring it back down and saw a smidge off of one side… But I saved that for tomorrow! Once this side is up, things should be easier. The board has more room above it, thanks to the angle of the roof and I’ll only have to mess with the light fixture… I think! With 50˚ predicted later this week, I might even get to the last of the chinking! Boy, am I an optimist or what? Let me get to Soap Stones tomorrow… I haven’t forgotten! We have the Epson Workforce 645 and TOTALLY LOVE IT!!!! Best (inexpensive) printer we’ve ever had..Easy set up, no frustrating problems. It’s great! I like HP because it is what I have had…. Picked up a cheep one at Sams in the fall and it took 5 minutes to setup. Wireless and blue tooth enabled, so the iPads, iPhones and all the computers (MAC and DELLS) in the house work with it. It is an all in one “almost”. printer, scanner, copier but no fax. Currently using Epson Workforce 545, MacBook Pro 15″ late 2011, MacOS 10.8.3 (Mountain Lion).